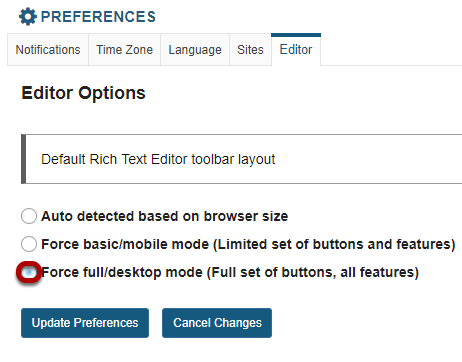 Sakai Community DocumentationSakai 19 User Guide (English) Rich Text EditorHow do I set my preference for the Rich-Text Editor mode? You may set your preference for the rich text editor toolbar display throughout the system if desired. From your Home area, select the Preferences tool. Prev: How do I embed an mp3 audio in a text box? Next: How do I change the right to left language direction?